Working in a high-tech environment is satisfying but a balance is important. So I try to spend some low-tech time in my workshop as often as I can. 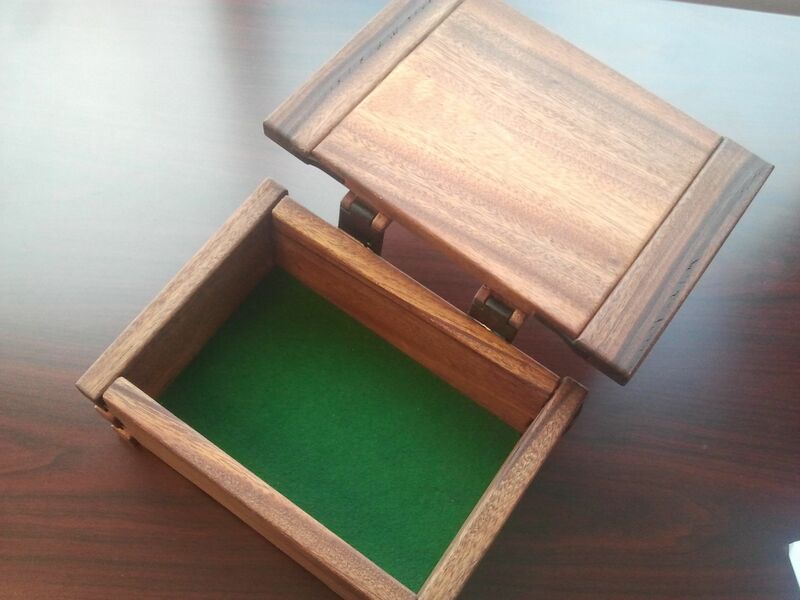 Through woodworking I can release some creative energy and practice my design skills. There is something reassuring about being able to create something with my own hands. I thought i would share some of my projects that I’m not too embarrassed about. 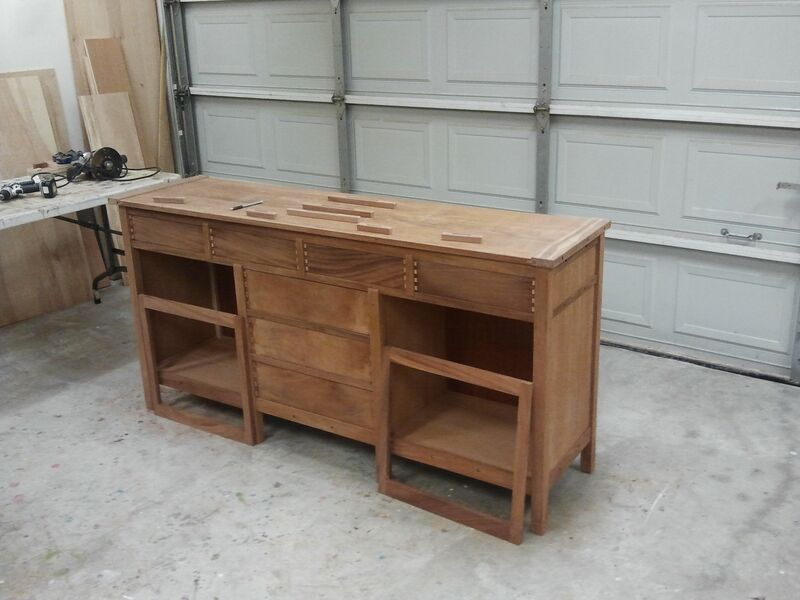 Let me know what you think, or just drop me a line if you want to talk about woodworking! I love the look of Greene & Greene furniture. Replicating their style proved to be very challenging both in design and execution, but I learned so much and was actually pretty happy with the results. This was my first Greene & Greene style projects. Start small, right? I needed to learn how to make the characteristic finger joints. 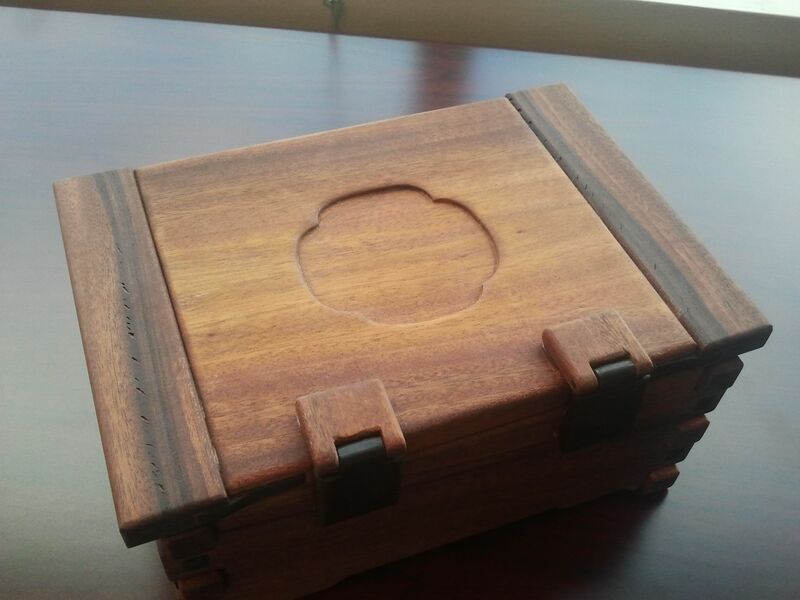 Of course, it’s mahogany and ebony. 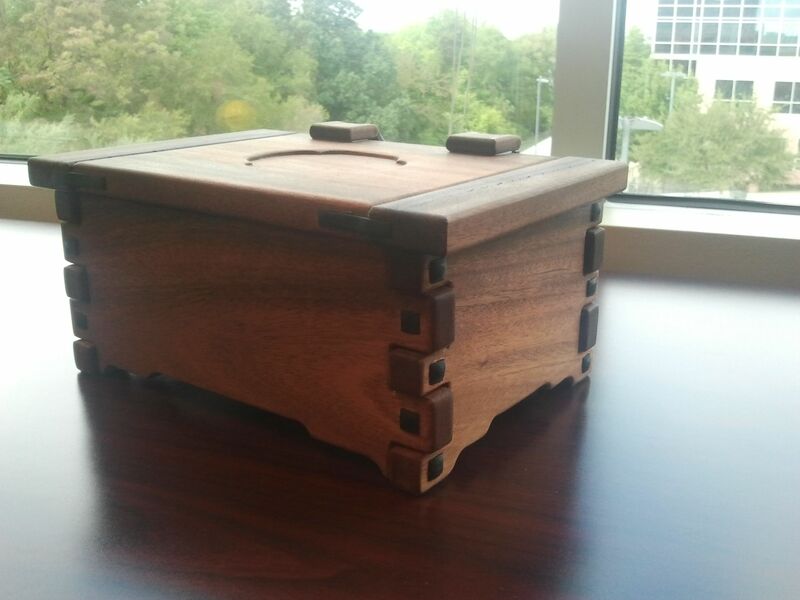 I even made the hinges so that I wouldn’t have any metal parts on the box. 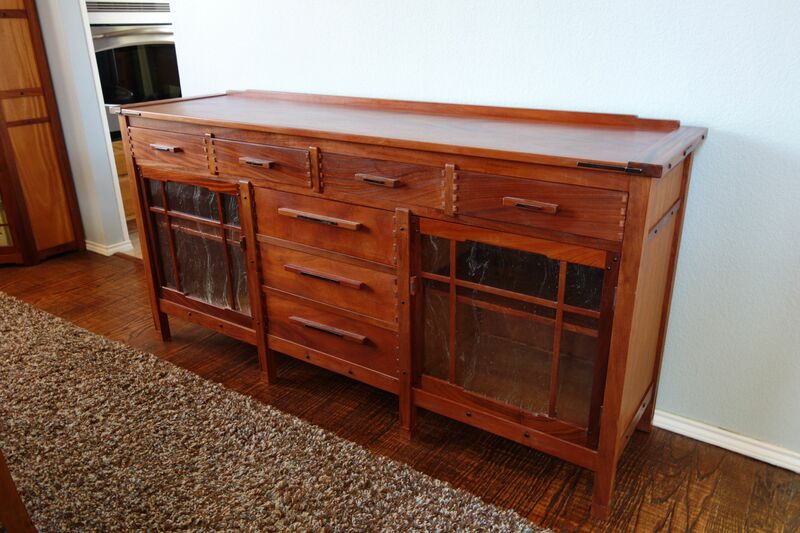 I felt good enough about the result that I ventured to build one of my dream projects: a Greene & Greene sideboard. 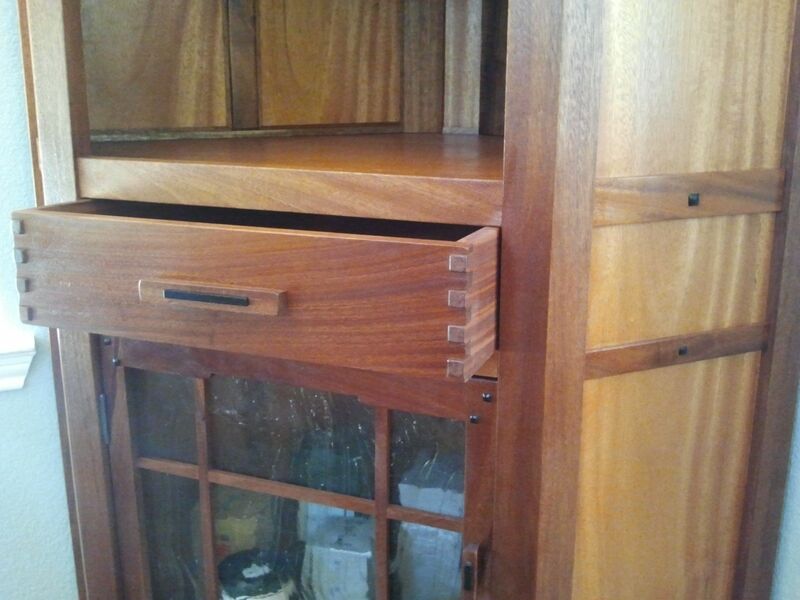 Here’s a view of the sideboard in progress. A total of 8 drawers and 2 doors would be needed. That’s a lot of finger joints!! 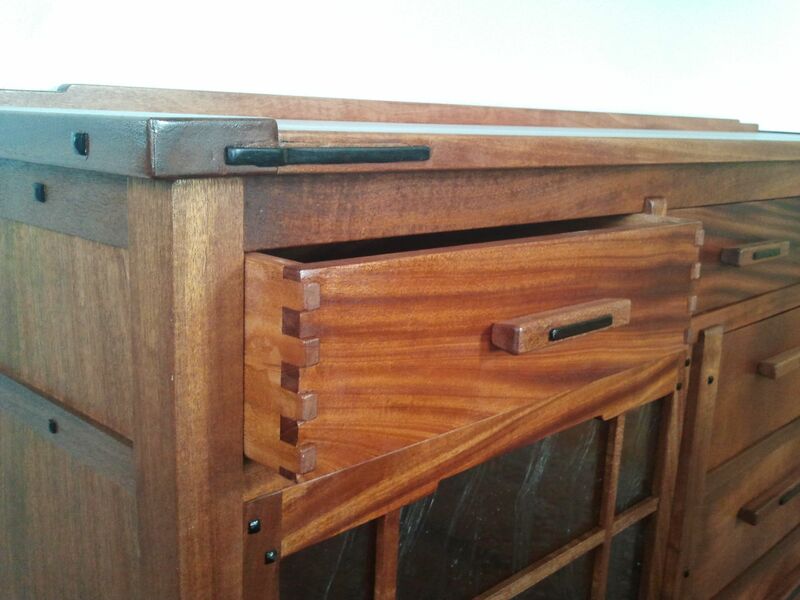 It’s all mahogany except the details on the drawer/door pulls which are ebony. I love the look of mahogany once it gets its first cover of shellac. The color gets even deeper and richer with time. This was the most challenging of all the projects. 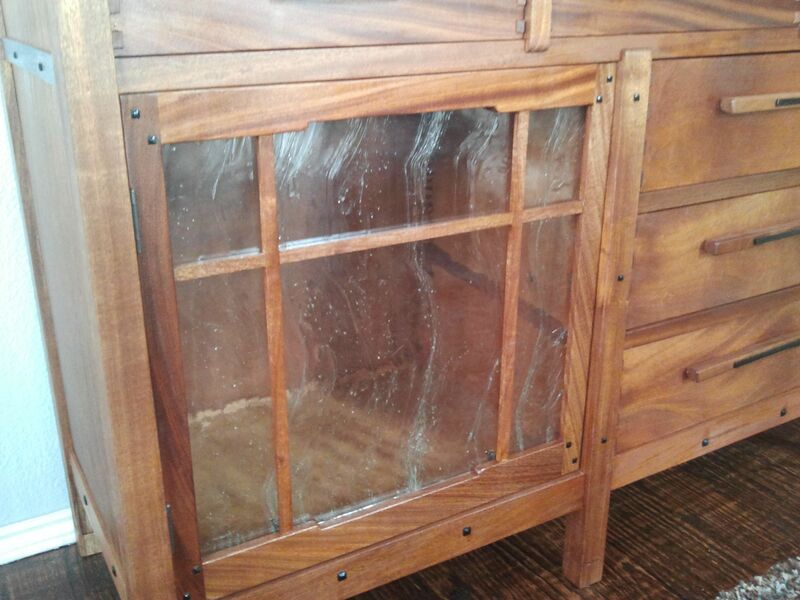 You can’t see it very well in the pictures but it’s actually a 6-sided cabinet with only two 90-degree corners. Getting a close fit was frustratingly difficult but when it all came together in the end I felt like I had climbed a mountain. It was all easy from there. My wife needed some home office furniture and we couldn’t find anything that we liked so this was an opportunity to design a few pieces in the same style. 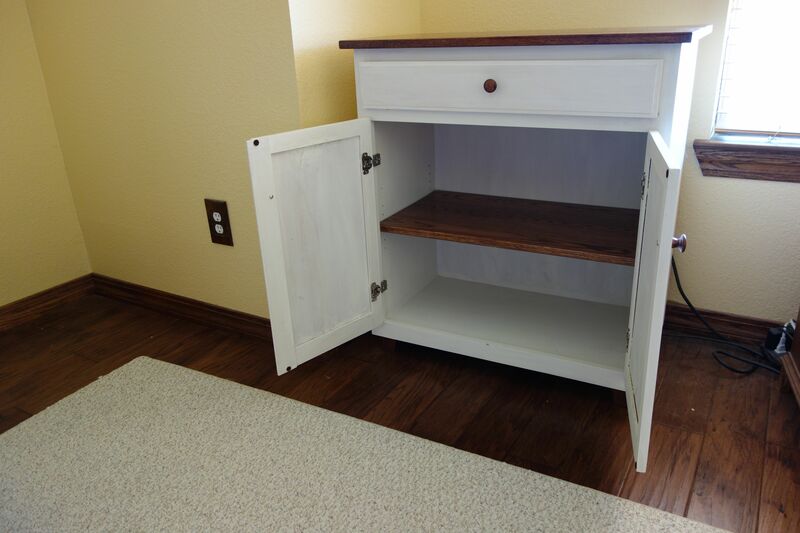 She liked the look of french white and I like the look of dark oak. The blend of the two worked well, I think. 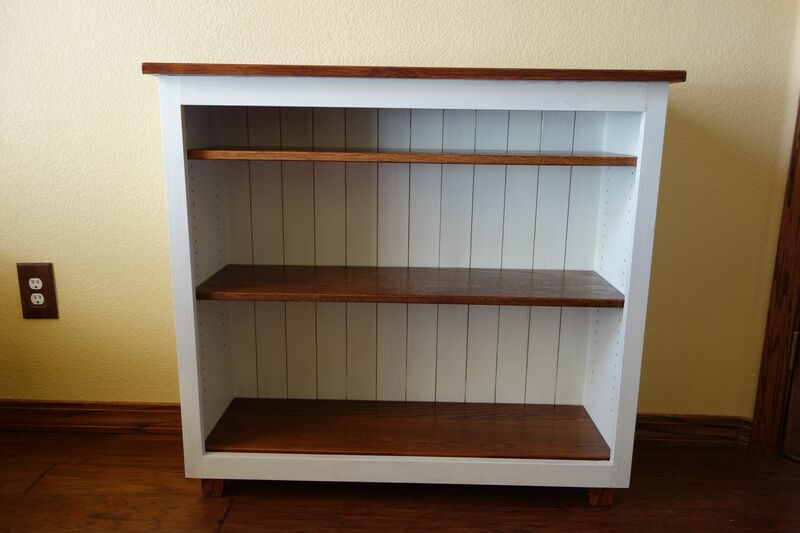 The first piece to be designed was a simple bookcase with adjustable shelves. 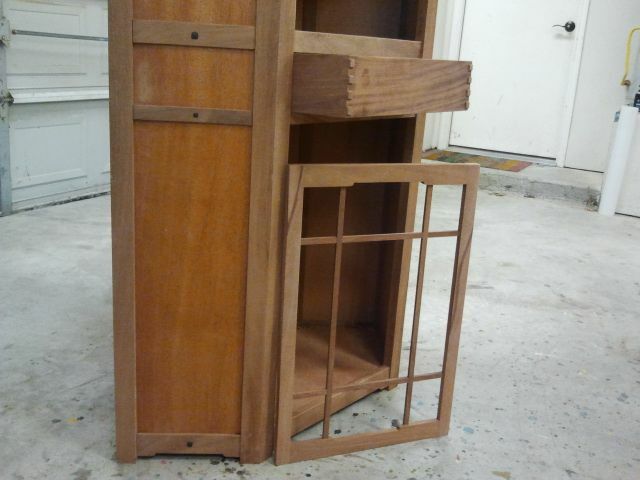 All these are made from poplar (painted white) for the casework and oak for the work surfaces. The back of this bookshelf was my first attempt at ship-lapped siding. We needed somewhere to put the printer, as well as store paper and other supplies. So a drawer and some cabinet space was needed. Rather than putting a vertical divider between the doors, I kept the space open with a flap on the left door for the right door to close on. 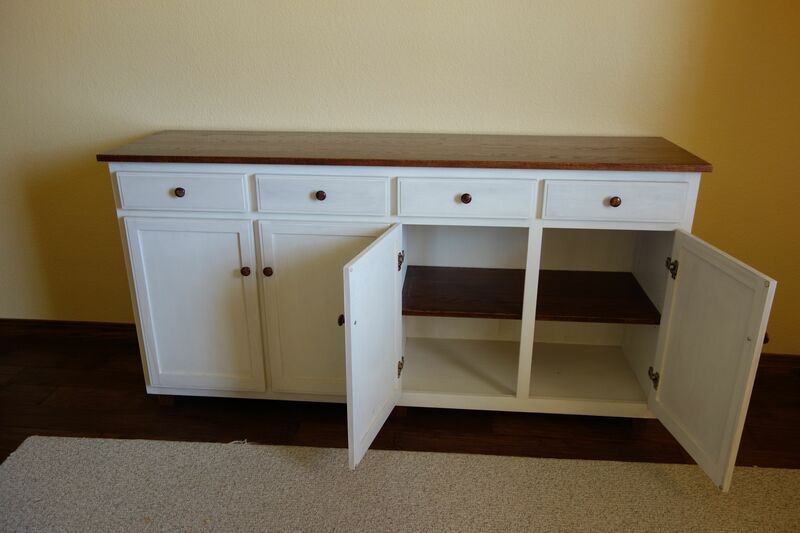 We needed a bit more storage space for various things and this sideboard provides a nice wide workspace on top as well as 4 drawers and two storage areas. 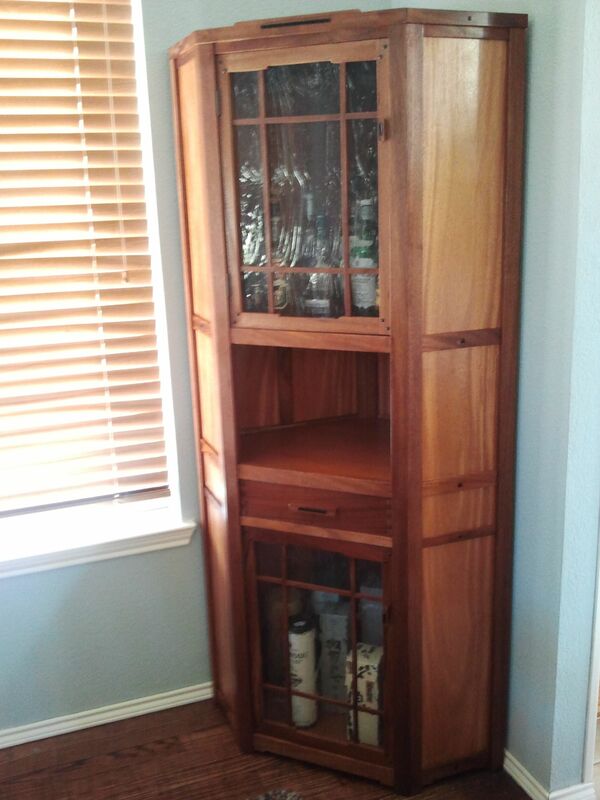 It’s a fairly wide piece of furniture but came to good use. Well, not all of it, but here is one view of the office. 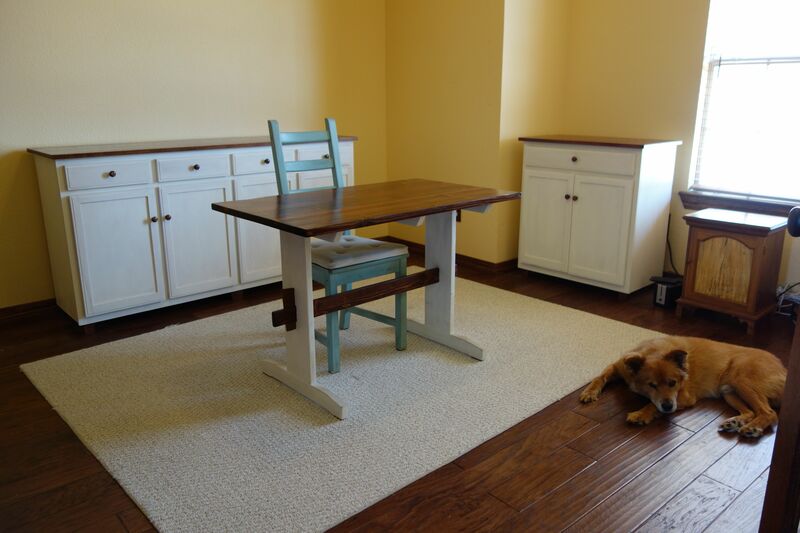 The table is an old table from Ikea that has sentimental value. It was getting very old and unstable so I restored it and finished it in the same style as the rest of the office furniture. Pretty happy that it looks like it fits in, although it’s all Ikea-style pine underneath the paint. This is not an original design, but one that I adapted from Steve Latta’s Pennsylvania spice box. 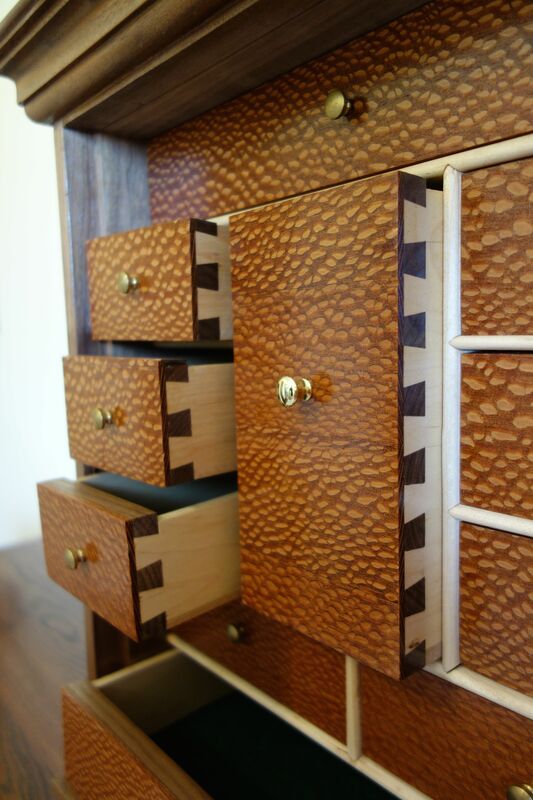 It’s a walnut case with drawers made from poplar and dressed with leopard wood veneer for the drawer fronts. 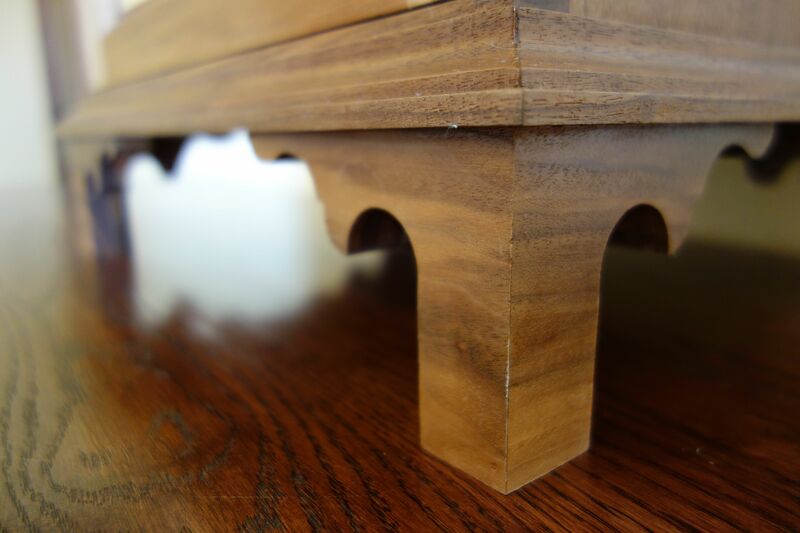 I made the molding from scratch on the table saw and router, and the project was quite a challenge in many other ways. 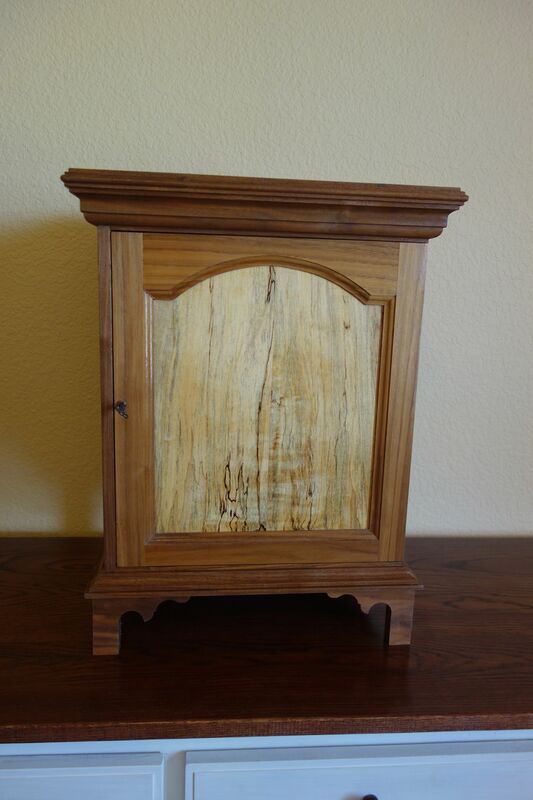 The door panel is a piece of spalted maple which I resawed and book matched. 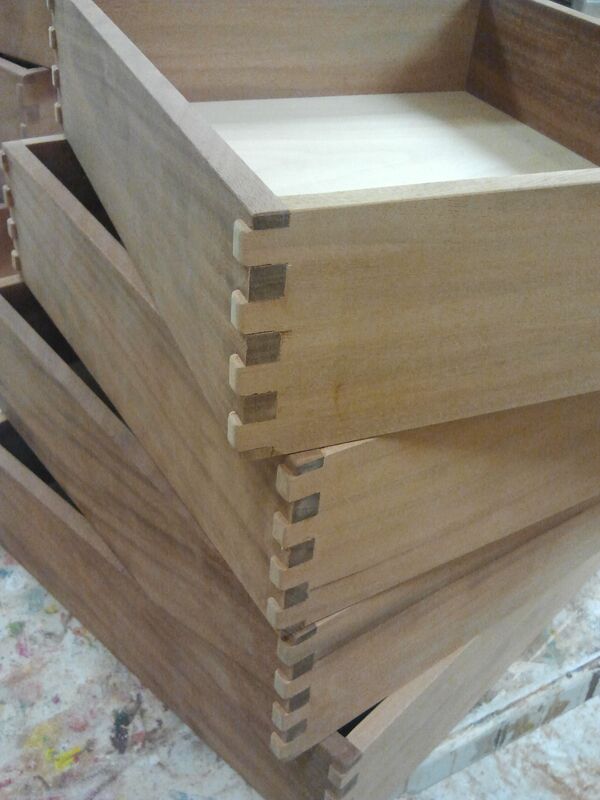 That’s 11 drawers with dovetail joints. Took a while to do them all but it looks very nice. Working on the legs were also fun, as I got to do a bit more ornate curves than I normally do.